The worst part about playing the Maple Leafs is their obnoxious fans. The worst part about playing the Flyers is… everything. The worst part about playing the Senators is definitely the pomp-pomp carrying media that covers them. Are you suggesting that its unfair to say that Karlsson is in the discussion for best player in the league this season? As for lapping the field, yes he's probably the best skating defenseman since Coffey, don't see a problem with that. Idoit40fans wrote: Are you suggesting that its unfair to say that Karlson is in the discussion for best player in the league this season? its a fair point to discuss, but if you read the Ottawa papers they ALWAYS overinflate their own players to the n-th degree. they will beat you over the head with the point that, he is, according to many unamed people, already the best player in the league. he is certainly a talent, but to already be putting him in comparison to Coffey, Lidstrom, and such is a bit over the top, don't you think? This won’t sit well with Ottawa fans. Cooke has a shady past and many believe if the incident wasn’t intentional, at the very least it was reckless and that’s why he should face some kind of discipline for what happened. 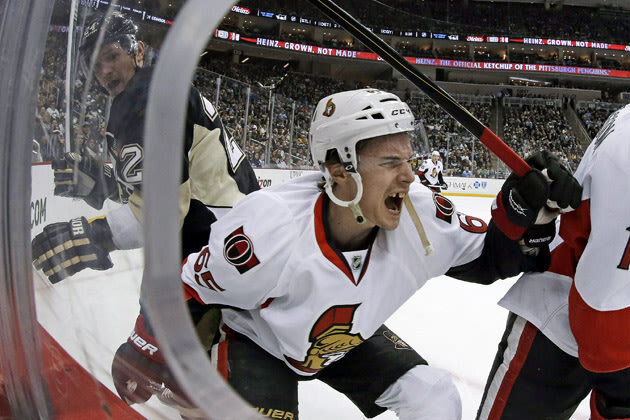 Karlsson returned to Ottawa with the Senators Wednesday after the game to have surgery here. He lacerated his achillies tendon. Two league executives told the Sun the normal recovery period is 4-to-6 months. I don’t agree with this decision. I think Cooke should get something just because he’s Matt Cooke. His colleague, Don Brennan, called the Senators out to attack Crosby, Malkin, Gonchar back in 2008. Good times. I don't see that level of homerism in print journalists, usually. no kevlar socks, helmet unstrapped, whose the irresponsible player here? That is going to be my new facebook profile picture. Cooke's reaction alone proves it's an accident. If it were premeditated, his face wouldn't show shock like tha. He outscored the next defenseman by 25 points. Prior seasons gap between #1 and #2: 6, 7, 9, 5, 2, 9, 4, 1, 3, 8, 11, 5, 2. Karlsson is the closest to Coffey the league has seen since Coffey. I have no problems saying Karlsson is the best offensive defenseman in the league. And his defense doesn't seem to be lacking because of his desire to score. Do you want me to go back to articles from 2009 and 2010 that were declaring Mike Green the new Paul Coffey? Lets cool it with players being the next Paul Coffey every few years when a young guy breaks out for a season or two offensivly. Karlsson is a great young player, I feel for the Sens and their fans, but Paul Coffey he is most certainly not. Yeah, I'd like for you go to back to those articles. What are you going to do when you get there? Karlsson was on his way to doing it for a second consecutive year. In fact, he was the entire offense for the Sens. He is still young, but its obviously that he is the offensively gifted defenseman since Coffey IMO. He isn't Coffey though, you are right about that. He is Erik Karlsson and his play has me believing his name will be remembered in the same tone as Coffey. We'll see how he comes back. Looks more like a "I'm ticked off and gonna slice your ankle you punk" face to me. thats his "what? i stomped as hard as i could and his leg is STILL attached?" face. Don Brennan, Ottawa Sun wrote: Matt Cooke must pay. Somehow. Somewhere. At the hands of someone. The guy is a Devil disguised in Penguin clothes. He essentially ended the career of Marc Savard without repercussion. Yes, he's been suspended a number of times for trying to decapitate others, but then Wednesday in Pittsburgh he almost chops Erik Karlsson off at the ankle, and again nobody is doing anything about it? People need to shut up about Savard. Brutal hit yes, legal at the time, completely. I suppose Cooke made good ol Marc lie to doctors and come play while his brains were still scrambled to. Pavel Bure wrote: People need to shut up about Savard. Brutal hit yes, legal at the time, completely. I suppose Cooke made good ol Marc lie to doctors and come play while his brains were still scrambled to. Didn't Mike Richards lay pretty much the exact same hit on David Booth of the FLA Panthers the same year? And nobody cried about that because A) its the FLA Panthers and B) the team didn't cause further damage to his career by trying to rush him back in time for a playoff series with the Flyers that year. This kills me. They cover a team with CHRIS NEIL on it, for heavens' sake. Equally as funny-Eugene Melnyck calling for goons (meaning Matt Cooke) should be banished from the league. Well Mr. Hypocrite, you can start by cutting Neil. Cooke at his worst is a different class of dirtball than Neil at his worst. And not in a good way. Just sayin. A big reason the gap was so big last year was the other top scoring defensemano were injured for a portion of the year. Points per game wise Karlsson was at 0.96. Pronger only played 13 games, but was at 0.92. Letang played 51 games and was at 0.82. Byfuglein played 66 games at 0.80. Had Letang played all 82 games at the same ppg pace the point difference was going to be around 12. Still very good, but not that different than other years. My problem with him is that he is deep in the offensive zone so often that he's not really playing defense, but more of a winger while the real winger has to cover his position for him. As far as I'm concerned he's a wing who starts lined up as a defenseman. That and when he actually tries to play defense he's not very good at it. In the first Pens vs Sens game this year he was the worst defenseman on the ice. Turnover machine. He was pretty invisible before the injury last game too. So what you're saying is that the article is correct, he is the next Coffey?